Construzione Automobili Intermeccanica is an Italian automobile manufacturer, founded by Frank Reisner in 1959, (Torino). Initially the company made tuning kits. 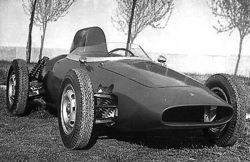 The first car was a Formula Junior car using a Peugeot engine (1960), and was followed by 21 aluminum-bodied Intermeccanica-Puch (IMP) 500ccm-engined cars, of which one won the Nürburgring. Larger american V8 engines were used in the «Apollo GT», of which 101 cars were made for International Motor Cars (1961-1965). The «Veltro» prototype however, had small Ford Anglia engine. These cars and some other prototypes were designed by Franco Scaglione. The «Italia» was a large sports car, of which 500 were made (1966-1970), followed by the eleven «Murena GT» (1971). With Bitter Cars and Opel, Intermeccanica developed the «Indra» (1971), followed by a few years assembling the Squire car. The company relocated to San Bernardino (USA) in 1975, and turned over to replica cars, such as the Porsche 356 Speedster (1976) and Checker (1979). It is now known as Intermeccanica International Inc., and has since 1981 been based in Vancouver (Canada). Intermeccanica today manufactures its trademark Roadster, a replica of the Porsche 356 1959 Convertible "D", as well as offering a replica of the 1940 World War 2 VW Kubelwagen "Type 82". Other products include a 1958 Speedster, "Turbo Look" versions of both the Roadster and Speedster. In 1975 the Turin establishment was closed and the company transfered to California. The Squire SS100 Roadster is a full size replica of the 1937,38,39 Jaguar SS100. It was fabricated by Intermeccanica in Italy between 1972-1973. There were only fifty Squires ever built and only 45 are known to still exist. Only three body colors were offered, red, yellow, and white. Wheels were true 72 spoke Dunlop wire wheels and were held on by a knock-off style wheel nut. The Squire has an original ladder-type frame undercarriage. Powered by the factory-correct Buick 310 Wildcat V-8 w/polished aluminum heads and alum, 4 bbl. intake manifold. A Borg/Warner T-10 4spd and Dana-44 posi are also factory options. 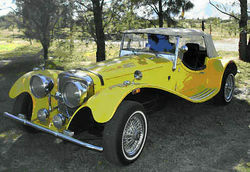 Remote power brakes and original Borrani knock-off wire wheels are present on this highly optioned thoroghbred. All exterior trim items are from Ferrari (grill, bumpers, lights, etc.) . 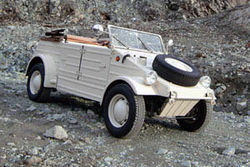 These vehicles were hand-made metal in Turin Italy in the mid 1960's. The Apollo (earlier version of the Vetta Ventura) was featured at the 1963 New York Auto Show, where it received rave reviews.